If you’re a slot gamer that loves nothing more than triggering a free spins round – and let’s face it, who doesn’t? 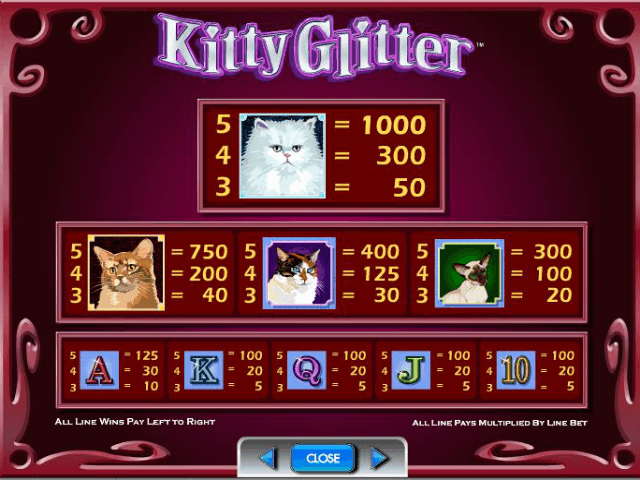 – then the Kitty Glitter online slot is the purrfect title for you. Not to confuse with the Pretty Kitty slot, this IGT developed online slot boasts a huge accumulation of 225 free spins up for grabs, as well as plenty of other hi-jinx with your furry companions. Remember to look out for a diamond in the rough too: this bonus-only wild symbol holds the key to Kitty Glitter’s most lucrative payouts. You’ll need to have a cat nap just to get over the excitement of winning one of these huge cash prizes! 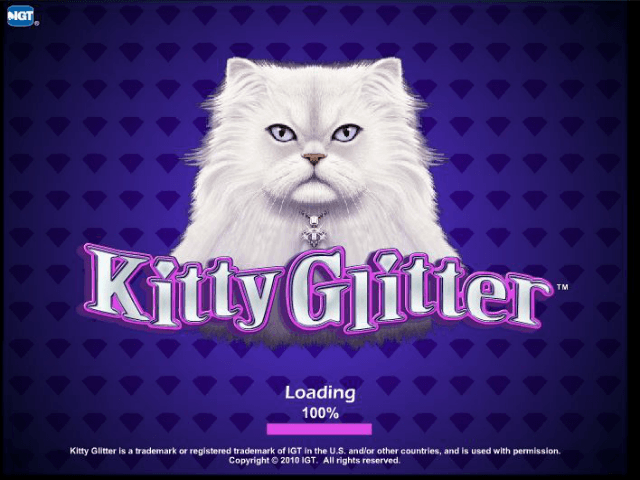 It couldn’t be easier to play the Kitty Glitter slot. All you have to worry about is modifying the number of paylines you wish to have live (any number from 1-30 is permissible), and then decide upon how much you want to bet per line (wager amounts of between 1.00 and 100.00 per spin). Once you've sorted this, you'll find these two factors will decide your stake amount per spin. For instance, 30 paylines x 1.00 bet per line = 30.00 wagered per turn. Decided how much you're willing to bet? Just hit the spin button and watch on as the cats leap into action. 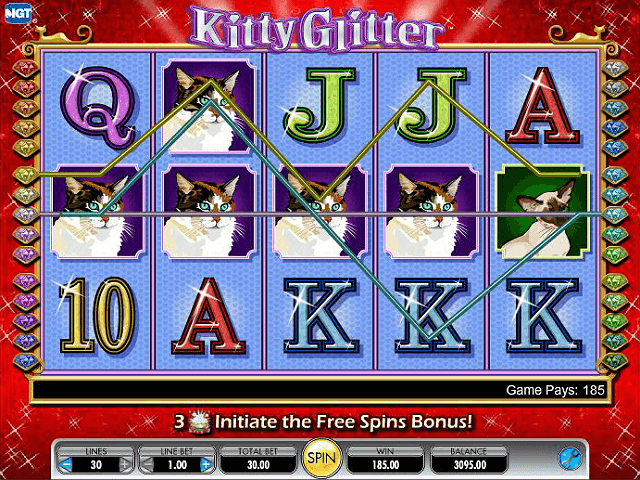 The big prizes in Kitty Glitter come courtesy of the wild and scatter symbols: triggering the free spins bonus round really is the key to landing the cash here. 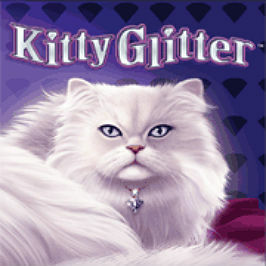 But first comes the wild symbol – the Kitty Glitter motif itself. This appears on all reels apart from the left, and substitutes for all other symbols apart from the scatter. This all helps to create winning combinations, and is the best way to enhance your chances of success. Keep your claws out for the scatter, too. This bag of shiny diamonds will appear on your middle three reels and pays three times your total bet amount every time you land three or more on screen. More importantly than this, however, is the scatter's other function: it's also the trigger for the free spins round. Again, a trio of scatters activates the bonus, with 15 free spins awarded. In this feature the diamonds turn wild and accumulate in reel five, with the power to rune other cat symbols wild too! 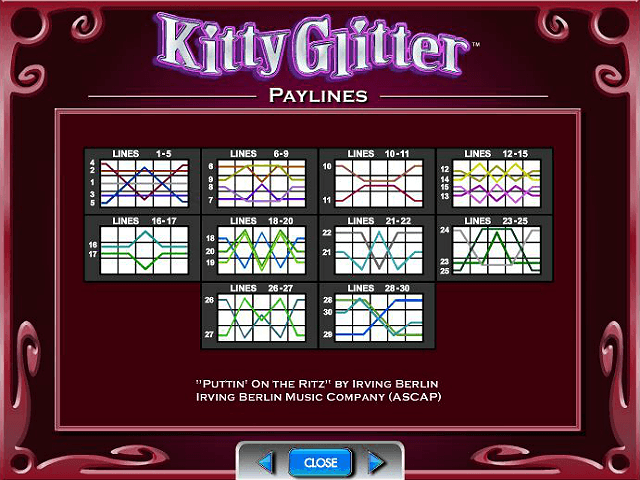 If you like Kitty Glitter - You'll like these slots too!